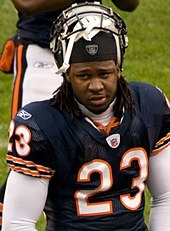 Wide receiver Devin Hester was drafted in the second round and holds several NFL records as a return specialist. Zach Strief was drafted by the New Orleans Saints in the seventh round and part of the offensive line which won the Madden Most Valuable Protectors Award twice. Owen Daniels was a fourth round pick and a two-time Pro Bowl selection. Marques Colston was a bottom-five seventh round pick but went on to win Super Bowl XLIV with the New Orleans Saints and set a string of franchise records for receiving yards and touchdowns. In the explanations below, (PD) indicates trades completed prior to the start of the draft (i.e. Pre-Draft), while (D) denotes trades that took place during the 2006 draft. ^ No. 11: St. Louis → Denver (D). The Rams traded their first round pick (11th) to Denver in exchange for their first (15th) and third round (68th) picks. ^ No. 12: Cleveland → Baltimore (D). The Browns traded pick their first round pick (12th) to Baltimore in exchange for their first (13th) and sixth round (181st) picks. ^ No. 13: Baltimore → Cleveland (D). see No. 12: Cleveland → Baltimore. No. 15: Atlanta → Denver (PD). Atlanta traded their first round pick to Denver in exchange for Denver's first (29th) and third (93rd) round picks and fourth round pick in 2007. No. 15: Denver → St. Louis (D). see No. 11: St. Louis → Denver. No. 22: Denver → San Francisco (PD). Denver traded pick 22 to San Francisco in exchange for their second round (37th) and third round (68th) picks. ^ No. 25: NY Giants → Pittsburgh (D). The Giants traded pick #25 to Pittsburgh in exchange for their first round (32nd), third round (96th) and fourth round (129th) picks. ^ No. 26: Chicago → Buffalo (D). Chicago traded pick #26 to Buffalo in exchange for their second (42nd) and third (73rd) round picks. No. 29: Denver → Atlanta (PD). see No. 15: Atlanta → Denver. No. 29: Atlanta → NY Jets (PD). The Falcons traded pick #29 to the Jets in exchange for John Abraham. ^ No. 32: Pittsburgh → NY Giants (D). see No. 25: NY Giants → Pittsburgh. ^ No. 34: New Orleans → Cleveland (D). The Saints traded pick #34 to Cleveland in exchange for their second round (43rd) pick and Jeff Faine. ^ No. 35: NY Jets → Washington (D). The Jets traded pick #35 to Washington in exchange for their second round (53rd) pick, sixth round (189th) pick and their second round pick in 2007. ^ No. 36: Green Bay → New England (D). The Packers traded pick #36 to New England in exchange for their second round (52nd) pick and their third round (75th) pick. No. 37: San Francisco → Denver (PD). see No. 22: Denver → San Francisco. No. 37: Denver → Green Bay (D). The Broncos traded pick #37 to Green Bay in exchange for Javon Walker. No. 37: Green Bay → Atlanta (D). The Packers traded picks #37 and #139 to Atlanta in exchange for their second round (47th) pick, their third round (93rd) pick and their fifth round (148th) pick. ^ No. 39: Tennessee → Philadelphia (D). The Titans traded pick #39 to Philadelphia in exchange for their second round (45th) pick and their fourth round pick (116th). ^ No. 42: Buffalo → Chicago (D). see No. 26: Chicago → Buffalo. ^ No. 43: Cleveland → New Orleans (D). see No. 34: New Orleans → Cleveland. ^ No. 44: Baltimore → NY Giants (D). The Ravens traded pick #44 to the Giants in exchange for their second round (56th) pick and their third round pick (87th). ^ No. 45: Philadelphia → Tennessee (D). see No. 39: Tennessee → Philadelphia. ^ No. 47: Atlanta → Green Bay (D). see No. 37: Green Bay → Atlanta. ^ No. 49: Dallas → NY Jets (D). The Cowboys traded pick #49 to the Jets in exchange for their second round (53rd) pick, sixth round (189th) pick and seventh round (211th) pick. ^ No. 51: Miami → Minnesota (PD). The Dolphins traded pick #51 to Minnesota in exchange for Daunte Culpepper. ^ No. 52: New England → Green Bay (D). see No. 36: Green Bay → New England. No. 53: Washington → NY Jets (D). see No. 35: NY Jets → Washington. No. 53: NY Jets → Dallas (D). see No. 49: Dallas → NY Jets. ^ No. 56: NY Giants → Baltimore (D). see No. 44: Baltimore → NY Giants. ^ No. 64: Pittsburgh → Minnesota (D). The Vikings traded picks #83 and #95 to Pittsburgh in exchange for pick #64. ^ No. 66: New Orleans → Houston (PD). The Texans and Saints swapped first round picks in last years draft, while the Saints traded this pick to Houston. No. 68: San Francisco → Denver (PD). see No. 22: Denver → San Francisco. No. 68: Denver → St. Louis (D). see No. 11: St. Louis → Denver. ^ No. 71: NY Jets → Philadelphia (D). The Eagles traded their third round (76th) and seventh round (220th) picks to the Jets in exchange for pick #71. ^ No. 73: Buffalo → Chicago (D). see No. 26: Chicago → Buffalo. No. 75: Baltimore → New England (PD). The Ravens traded this pick to New England along with their third and sixth round picks in 2005 in exchange for their second round pick in 2005. No. 75: New England → Green Bay (D). see No. 36: Green Bay → New England. ^ No. 76: Philadelphia → NY Jets (D). see No. 71: NY Jets → Philadelphia. ^ No. 80: Dallas → Jacksonville (D). The Cowboys traded pick 80 to Jacksonville in exchange for their third and fourth round picks (92 and 125). ^ No. 83: Minnesota → Pittsburgh (D). see No. 64: Pittsburgh → Minnesota. ^ No. 87: NY Giants → Baltimore (D). see No. 44: Baltimore → NY Giants. ^ No. 92: Jacksonville → Dallas (D). see No. 80: Dallas → Jacksonville. No. 93: Denver → Atlanta (PD). see No. 15: Atlanta → Denver. No. 93: Atlanta → Green Bay (D). see No. 37: Green Bay → Atlanta. ^ No. 96: Pittsburgh → NY Giants (D). see No. 25: NY Giants → Pittsburgh. ^ No. 119: Washington → Denver (PD). see No. 22: Washington → Denver. ^ No. 125: Jacksonville → Dallas (D). see No. 80: Dallas → Jacksonville. ^ No. 129: Pittsburgh → NY Giants (D). see No. 25: NY Giants → Pittsburgh. ^ No. 134: Houston → Buffalo (PD). The Texans traded pick #134 to the Bills in exchange for wide receiver Eric Moulds. ^ No. 139: Green Bay → Atlanta (D). see No. 37: Green Bay → Atlanta. ^ No. 148: Atlanta → Green Bay (D). see No. 37: Green Bay → Atlanta. ^ No. 181: Baltimore → Cleveland (D). see No. 12: Cleveland → Baltimore. No. 189: Washington → NY Jets (D). see No. 35: NY Jets → Washington. No. 189: NY Jets → Dallas (D). see No. 49: Dallas → NY Jets. ^ No. 211: NY Jets → Dallas (D). see No. 49: Dallas → NY Jets. ^ No. 220: Philadelphia → NY Jets (D). see No. 71: NY Jets → Philadelphia. Two individuals declared for the draft never having played college football: Jai Lewis, a power forward for the George Mason basketball team that reached the semifinals of the 2006 NCAA Division I men's basketball tournament; and Ed Nelson, a power forward for the Connecticut basketball team. Lewis signed after the draft as a free agent with the New York Giants to play offensive tackle but subsequently pursued a professional basketball career, while Nelson signed with the St. Louis Rams to be a tight end. Nelson later turned to professional basketball himself. Having been banned in 2004 from playing college football at Colorado for having accepted endorsements while a member of the United States Ski Team, wide receiver and kick returner Jeremy Bloom was drafted in the fifth round by the Philadelphia Eagles. Virginia Tech quarterback Marcus Vick, who was dismissed from the Hokies team in January 2006 for repeatedly violating team rules, was undrafted; Vick, the younger brother of former Atlanta Falcons quarterback Michael Vick, later accepted an invitation to attend a Miami Dolphins minicamp and ultimately signed a contract with the team as a wide receiver. He was then released the following season. Running back John David Washington, son of actor Denzel Washington, went undrafted out of the Division II school Morehouse College, where he rushed for 1,198 yards in his senior season, setting a school record; Washington was signed as a free agent by the St. Louis Rams. ^ "Who's No. 1? Texans, Williams sign contract". Archived from the original on May 6, 2006. Retrieved April 29, 2006. ^ Williams became the first-ever number one draft pick to come from a school in the Atlantic Coast Conference. ^ Reggie Bush was named the 2005 Heisman Trophy winner, but the award was forfeited due to issues with Bush's college eligibility "Reggie Bush to forfeit Heisman". ESPN.com. Retrieved March 28, 2011. ^ The University of Texas at Austin extended its streak of consecutive drafts in which the school produced at least one drafted player to 69. ^ Matt Leinart, 2004 Heisman Trophy winner "2004 Heisman Trophy winner". Archived from the original on July 6, 2011. Retrieved March 28, 2011. ^ Cromartie was the fourth Defensive player from Florida State selected in the first round; only twice previously had one school produced four first-round selections from one unit (offense or defense) in a single NFL draft. ^ The University of Miami extended its streak of drafts in which at least one player from the school was selected in the first round to 12. ^ Bullocks' identical twin brother, Josh Bullocks, also a safety from the University of Nebraska–Lincoln, was drafted by the New Orleans Saints in the same position in the 2005 draft. ^ The Chiefs transferred the 117th overall pick to the Jets as compensation for the Jets' permitting Herman Edwards to leave the Jets to become head coach of the Chiefs. ^ Cincinnati forfeited their third-round selection in the 2007 Draft. "Cincinnati Bengals Pick Ahmad Brooks in NFL Supplemental Draft". University of Virginia Athletics. July 13, 2006. Archived from the original on October 27, 2011. Retrieved October 27, 2011. ^ Pasquarelli, Len (July 15, 2006). "Former George Mason hoops star ends NFL dream". ESPN. Retrieved April 29, 2013. ^ Pasquarelli, Len (April 30, 2006). "UConn basketball player Nelson signs with Rams". ESPN. Retrieved April 29, 2013. ^ Associated Press (April 7, 2004). "WR/skier still fighting endorsement ban". ESPN. Retrieved April 29, 2013. ^ Pasquarelli, Len (May 3, 2006). "Undrafted Hokie QB will get look from Dolphins". ESPN. Retrieved April 29, 2013. ^ Associated Press (May 15, 2005). "Dolphins sign Marcus Vick". USA Today. Retrieved April 29, 2013. ^ Associated Press (May 2, 2006). "St. Louis Rams Sign Denzel Washington's Son". Fox News. Retrieved April 29, 2013. "NFL draft history: 2006 full draft". Official NFL website. Archived from the original on October 24, 2008. Retrieved November 13, 2008. "2006 NFL draft". ESPN website. Retrieved May 10, 2006. "Pro Football Draft History: 2006". Pro Football Hall of Fame website. Retrieved November 13, 2008. "2006 NFL Draft". pro-football-reference.com. Archived from the original on December 20, 2008. Retrieved November 13, 2008. "2006 NFL Player Draft". databasefootball.com. Archived from the original on December 31, 2008. Retrieved November 13, 2008.